If you’re like me you have a collection of business cards that you’ve gathered from meetings and conventions over the years. They’re usually on crisp cream or white card stock with precise edges and raised type lettering. A freshly printed card is a pleasure to hold in your hand. But you’re also holding a bit of history. People have been using calling cards as little paper ambassadors since at least the seventeenth century. They were first the exclusive domain of royalty and nobility who announced their arrival with a personal engraved card. This practice was eventually copied by ordinary people as a polite gesture. 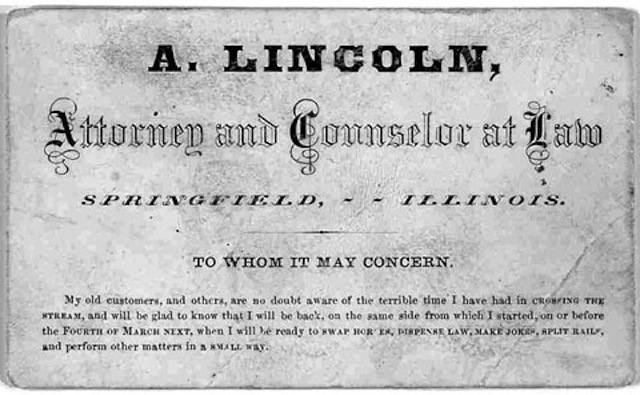 The commercial function of the calling card has similarly deep roots in history. At about the same time princes and dukes were exchanging their engraved cards, tradesmen printed their own on cardstock as a form of advertisement. These two types of cards — the personal and the commercial — merged around the beginning of the 20th century and became the business card we’re all familiar with. Today there are 27 million business cards printed daily in the U.S. and 10 billion printed each year. The reason for all these cards is clear. According to BusinesscardABC, for every 2,000 business cards a company hands out, company sales increase by 2.5%. Few things are as ubiquitous as business cards and yet as freighted with individual meaning. In some countries business cards are considered an extension of the person whose name is on it and they’re accorded the same level of respect as you would show to the person. But here in the U.S. we’ve taken a far more casual approach. There are still some people with simple white cards and black letters in a somber font, but increasingly innovation is the way to go. Modern printing technology has allowed people to unleash a wave of business card creativity. The Paper and Packaging Board staff have business cards made of corrugated, paperboard and textured paper with colorful type on one side a foil stamp of the P+PB on the opposite side—they’re a great conversation starter when talking about the work of the board and Paper Checkoff. But even with the proliferation of online networking sites such as LinkedIn, printed cards on paper are still extremely popular. That’s because there is no substitute for a physical card . . . or for an electronic contact. Like so many other examples, paper and digital formats are not in conflict –they’re complementary. And that’s good news for all of us who use digital technology and love paper.